While down in the big city at a wild Whole Foods, I encountered several “cinnamon” varieties that begged for more testing. There is a distinct difference between what is commonly available as “cinnamon” (Cinnamomum cassia) and “true” or “ceylon” cinnamon (Cinnamomum verum), and we have previously looked at cinnamon varieties in Apple Pies for Pi-day! – but in that case it had to play nicely both with the apples and the expectations for apple pie. 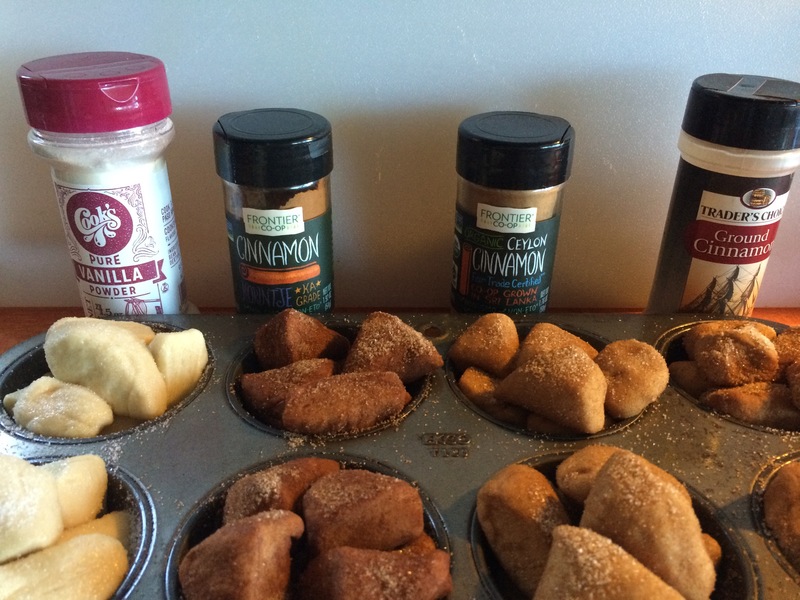 Here, we tested cinnamon (and one non-cinnamon) in a more pure test of the sweet-variety. The Vanilla Powder was added to the mix as I’ve heard vanilla buns made with Torsleff Vaniljesukker are pretty popular in the Scandinavian countries (e.g. here and here). I followed the Pillsbury Monkey Bread Muffin recipe for general ratios and baking instructions. Note that the direction to “roll” the dough in the cinnamon sugar mixture might be important – shaking didn’t quite work. Tie Ground Cinnamon Favorite! (1x) Really not much to say here other than it tasted as “expected”? Tie Korintje Favorite! (1x) More aromatic than the generic “ground cinnamon”, spicy and warm. One taste tester thought this had more pronounced flavors than the generic and was “nice and bitey” but that this application might require more tame flavors. 3 Ceylon Again, more aromatic and pronounced flavors than the generic but on the more delicate and sweet side. 4 Vanilla Described as “weird” and “odd” in this application. A bit too subtle – might work better combined with one of the cinnamons? Coated dough chunks ready for a caramel glaze and then baking. One person was so noncommittal that they didn’t pick a favorite (ok.. that was me). Similarly to the apple pie, we ran into an expected/familiar issue as this isn’t a novel baked good, and it is hard to get past what the brain expects from a food. Along those lines then, how would these different varieties (well… maybe not the vanilla) play in a more savory dish that the resident testers maybe have less mental baggage on?